Happy, Happy New Jewelry Year! I just wanted to take a few minutes between the hoop-la that is still going on around here and wish my Jewelry Weblog readers a wonderful New Year. I hope you are sparkling it up with all your fab-O bling and baubles while you sip the bubbly. I'm looking forward to another great year as your Jewelry Weblog blogger! Here's to 2007! Bring it on! Just in time to get you out the door to that party tonight, we have some wonderful jewelry and fashion advice so you look your best. 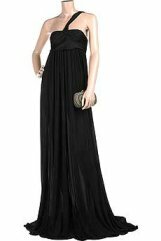 The Bag Snob gives us New Year's Party looks for snobs of every taste and budget! Coquette picks the best large bags to fit any kind of budget. A leopard wrap dress is great for parties, dates, or whenever you need to channel your inner wild beast. Beyonce shows how it's done, says Fashiontribes. LA Story says to Get Your New Years Eve groove On With a FABULOUS Menu From Chef Vanessa! Party On With GREAT Food and Super Ideas on What to Serve. This "Fox Trot" Christian Louboutin peep toe is courting KRiSTOPHER's love with its golden sole. Stylehive's latest Hot Product: Ralph Lauren's Dog Sweaters, For Preppy Pooches. eBeautyDaily offers the Best of 2006 Beauty and more. You can't resist a handbag giveaway. Hurry and sign up for the eBelle5 Holiday Handbag Giveaway brought to you by Elliott Lucca. Jewelry and Beading suggests going with chandelier style earrings if you are looking for extra party bling. See Pretty Things has found a cool fool's gold ring. Busy with Style covers winter trends, including chunky shoes. As I replied in a comment concerning a previous post about Moissanite, I've been doing more research on this and other simulated diamonds with the idea of this follow up post. At the time of my first post, I was looking into this subject just out of curiosity without any idea of the passion some readers had concerning the pros and cons of this and other simulated diamonds in general. Little did I know, that my husband, with the intention of coming up with some sparkling jewelry Christmas presents for me, was also researching this topic. What a small world, even in your own house. After reading a lot of different information on line, he opted for a simulated stone, actually three – one for a pendant and two for earrings, from Diamond Nexus Labs, which he then set himself in 14kt gold settings. Oy, many of my magazine subscriptions are coming due. Do I renew my subscription? Do I pass? This is always tough for me to decide because there are just so many great magazines and so little time to read them all, and I really do enjoy reading every single word. I guess that's the old English major in me. I feel compelled to read it all, no cheating allowed. My most recent issue is with Accessories magazine, which I've mentioned here a few times. It's a pretty slim volume, with loads of ads, but just the same, they do have up the minute and then some information on jewelry trends and other accessories. But the cost of this puppy has gone up from what my old brain remembers. I think I paid something like 35 dollars last year, and now the subscription ticket says it's 43.75 for another year! Ouch! So, do I or don't I? Do I pass this year and rely on the other zillion magazines I get and web sites I cruise? Any other Accessories subscribers out there with this same problem? 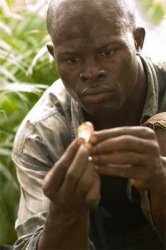 For awhile now, I've been reporting on what I've heard (and really read) concerning the whole Blood Diamond issue. Last I read, and this could be propaganda obviously from the jewelry industry, the movie didn't do much to hurt diamond dealers. While I'd like to personally believe (I mean, really, who wouldn't) that this fictionalized story is just that, a story based on facts from the past but not at all true today, I still can't help be a little cautious, which is one reason I've been exploring the idea of simulated diamonds. Although Blood or conflict diamonds have been a front burner issue for several years, diamonds are not the only gemstone or the only commodity used to exploit and enslave our fellow man. If you drink Florida orange juice, eatin Burmese sugar, buy Chinese products, wear Egyptian cotton or eat chocolate , according to the 2002 issue of National Geographic, you may be funding human misery. The U. S. currently imposes economic embargos on goods made in a number of nations, North Korea, Iran, Burma, in an attempt to economically throttle these malignant and repressive dictatorships. Does it do any good? Those who advocate the use of economic sanctions point to the experience in South Africa where a worldwide boycott, that somehow did not inclued diamonds, contributed to the fall of the white minority regime and the end of apartheid. Others are not so sure! I'm not sure if Wise has all the answers either to this issue, but I think his post is worth a read for those who are concerned about diamonds and the history that surrounds them. I like it when I see a jewelry designer who isn't afraid to break out of the fine jewelry box. He or she may have the skills to create gold and Diamond Jewelry, but they know there's more to jewelry designing, if you really want to be an artist that is, then the same ol' same ol' that you see in every fine jewelry shop you happen to walk by. Marco Bicego seems to be that kind of jewelry artist who isn't afraid to mix it up a bit, though I was a little disappointed that the images on his web site weren't larger and didn't provide more details. Are those ruby beads on those earrings? Tourmaline? 18kt gold? I need details man! But, still, fun to just enjoy looking…. Going along with my theme of looking back at 2006 and sort of also looking forward to 2007, I wanted to take a moment and consider some of the jewelry trends we've seen over the past year. 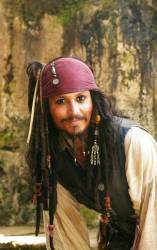 First, thanks to Johnny Depp, we have had lots of pirate jewelry. This was very much due to his second Pirates of the Caribbean movie. Of course, there is a third episode coming out in 2007, but some how I get the feeling we won't see a lot of this next year. It was fun, but I don't think it's here to stay. Then there was Keepsake type jewelry, items such as lockets and photographs incorporated into jewelry designs that invoked memories. I think anything connected with the idea of memories and nostalgia will stick around next year. Circles, circles and more circles. We saw them in diamond jewelry. We saw them in the form of chains and links. The circle was "in" this year. 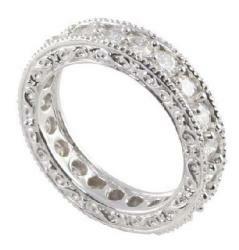 Another big diamond trend was the Journey Diamond design, followed by the same look in pearls. Jewelry components such as beading are also makes its way to clothing thanks to designers such as Mark Badgley and James Mischka. Finally, a big trend this year that I also expect to see around in 2007 is mixed media. Companies like Juniper Designs and 3-Sisters Jewelry will continue to surprise us with unlike items in our jewelry designs, teaming up beads with the everyday. 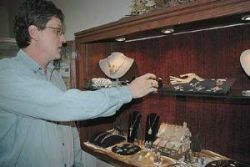 I discovered a small town newspaper article on line about jewelry maker Mike Trembly, and luckily it had a link to his web site, which I can tell you is not always the case. The award, given by the Ohio Designer Craftsmen organization out of Columbus, is called the Award for Excellence. Trembly said he believes he got the award for the unique quality of his metal and stone jewelry. "What makes you stand out is making work that is distinctively yours and that's what I strive to do," Trembly said. Okay, now for the good stuff – his wonderful jewelry. Like most of us a few days before the New Year, I'm thinking back over 2006. I'm going start with some of my favorite jewelry designers (and yours) I've posted about over the last year. As I've expressed before, I'm no expert. I joke that I'm a "jewelry journalist," but honestly, I'm a writer (and, yes, big difference between writer and journalist! 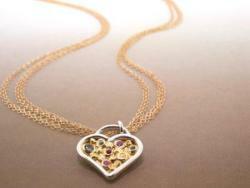 ), a jewelry designer myself, and a person who appreciates the craft of creating jewelry. I write my thoughts on a topic I enjoy. That's it. Some can take it, and some can leave it. Luckily, I have found over the past year (plus) that most of my readers are like I am and enjoy my thoughts on jewelry. Jennifer "JJ" Singh from Matisse Designs- The necklace pictured is an example of her unique metal work. Kenneth Fron – Heavy on the bead and the passion – he obviously loves his work. Laura James – An up and coming jewelry designer, Laura is beginning to incorporate more metal into her gemstone beaded designs. It will be interesting to see her design skills develop over the next year. Yummi Glass designer Allison Overbeke shows us what can be done with glass of all things for creating beautiful and colorful jewelry. Karin Collins from Spoonfed Art – Another unique approach to using materials not often seen in jewelry, and she helps out a cause at the same time. Sonya Ooten – Not everyone can pull off Crochet wire jewelry, but she does. Pallavi Dudeja Foley – She will continue to be a jewelry trend setter, no doubt. Jenifer Altman of Juniper Designs – She hit it big with the vintage slash mixed media look. What will she bring us in 2007? Juliet Renee Williams, owner of JulRe Designs – Managing to give us chunky, funky, and still something you could wear to work, this designer always seems to be ahead of the trends. Designer Vincenzo Taormina – Will he continue to please us with his clean lines and contemporary jewelry designs? I hope so! Jewelry designer, Lulu Frost – Who will forget her number necklaces and watch earring? Meredith Miller – She's another jewelry designer who turned to mix media techniques with her poker chip jewelry. The more the merrier here as my jewelry and fashion link round up is a tad late. Hey, it is a holiday! eBelle5 selects a Louis Vuitton Miroir Palladium Gold Purse (pictured). eBelle5 shows you what you can get with a six figure price tag, an LV white gold embossed clutch! eBeautyDaily reports on WWD auctions off couture stockings for charity. My Fashion Life falls head over heels once again for Dior's limited edition saddle bag. At LA Story West Coast Leather Gets Haute with New Leather Fashions . Girlawhirl can get home from the nail salon with her feet warm and toasty thanks to bootie pies. 'Tis the season for a lot of things, including taking a little time to pamper your very deserving self. Fashiontribes has the Top 10 ways to relax & refresh. Coquette's Natalie Zee shows you how to wrap gifts with style this holiday season as she visits the local San Francisco afternoon TV show "The View from the Bay". Vogue Loves Bag Snob and Bag Snob Loves Vogue- Bag Snob featured in UK Vogue and French Vogue this month. Luxurious, last minute gift ideas from Aesthetics + Economics.